It had been on my ‘to read’ list for years, which is probably one reason why I never got around to reading it; that all-too-familiar self deceit that accompanies the knowledge that having placed something somewhere it is now under one’s ‘control’, done with. Done with, at least until someone else mentions it in such a way that the chicanery threatens to become exposed, as happened a few weeks back when William Storrar was in town to deliver a couple of public lectures. In one lecture, titled ‘The Common Good: A Question of Style’, Storrar attempted to offer a kind of theological justification for democracy. (My friend Andrew wrote a bit about it here.) With refreshing ease, wit and insight, the big Scotsman drew upon a host of material from a wide range of sources. He spoke about David Hollenbach’s Christian ethic of the common good. He mentioned Paul Tillich’s brilliant essay on ‘The Protestant Principle and the Proletarian Situation’ in which Tillich argues that ‘what makes Protestantism Protestant is the fact that it transcends its own religious and confessional character, that it cannot be identified wholly with any of its particular historical forms’. Storrar referred to this trait as a way of underwriting Protestantism’s ‘prophetic scrutiny’. And Protestants need to recover their nerve, he said, to be both disciples and citizens who seek the welfare of the city. Here he drew, I guess unsurprisingly, upon Marilynne Robinson’s very fine essay ‘Open Thy Hand Wide’ (published in When I Was a Child I Read Books), and upon, somewhat surprisingly given the topic, Alan Lewis’s extraordinary study on Holy Saturday, and upon the work of the Scottish architect Alexander Thomson who championed a vision of public space which is both open and horizontal. Most cited, however, and not only because he happened to be in the room, was my dear friend and distinguished church historian Peter Matheson and his book The Rhetoric of the Reformation. The Reformation ‘game’ succeeded because it lured onlookers into becoming participants, to join the dance … [T]he word spiel, game, was often used by the Reformers to describe the events in which they were involved. The difficulty of course, was that the traditional referees – the bishops, councils, and Popes – had been sidelined, ‘sin-binned’. It was a game, therefore, in which the rules were being reinvented as it proceeded. 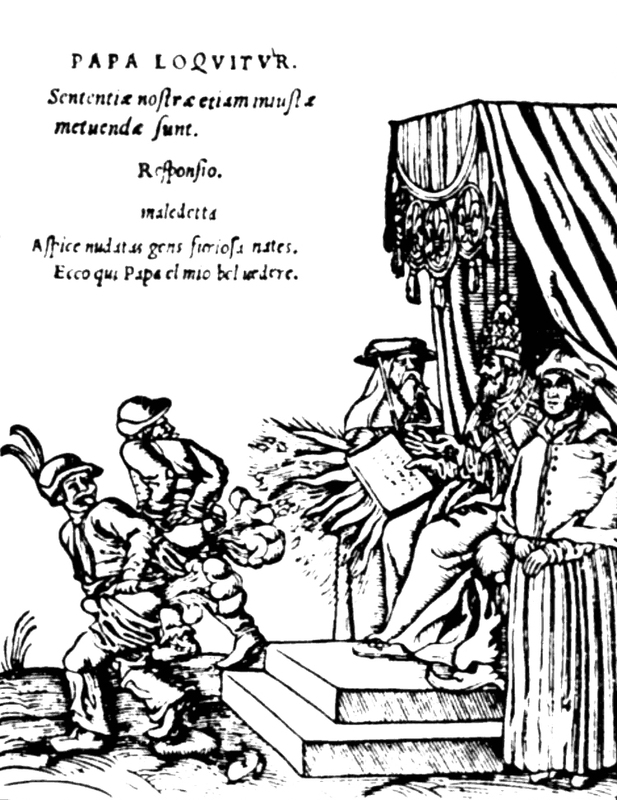 The daring, passionate preachers, the initiators of communal liturgies, the authors of the smudgy, cheap pamphlets and broadsheets which landed on German laps in their tens of thousands in the 1520s were, of course, serious enough, ready to risk career and even life for their convictions. But on another level they were hucksters standing behind their several booths, enticing people to ‘have a go’, to sing along with the Wittenberg nightingale. ‘If, then, you long for truth then come and join us in the dance’, writes Thomas Müntzer to the people of Erfurt at the height of the Peasants’ War. Matheson gets – and that much more than most – that the Reformation was about something much more profound and basic than structural and doctrinal reform. It was ‘a paradigm shift in the religious imagination’. ‘Each pamphlet’, he argues, ‘is witness to a collapsed consensus, and simultaneously signposts the dream of a new religious landscape and inscape. The broadsheets and wood-cuts of the period confirm this. They present the birthpangs of a new age in visual terms: a drastic, simplistic confrontation of dawn and dusk, light and dark, discipleship and corruption, freedom and tyranny. Their striking images are littered with rhymes, slogans, catch-phrases which decoded them, above all with what we can call God’s graffiti, quotations from Scripture’. Like his The Imaginative World of the Reformation and his most recent Argula von Grumbach (1492–1554/7): A Woman before Her Time, Matheson’s The Rhetoric of the Reformation is a much welcome breath of fresh air among the shelves of mostly turgid and arenose literature on the Reformation. There are some remarkable exceptions of course, MacCulloch’s general introduction being the most obvious, but there might not be anything nearly as fun or which liberates the sixteenth century movements of reform from those flat retellings and makes it come alive in 3-D as a period in which we see our own foibles and idiosyncrasies being played out. While on the topic of books, I hit a wee jackpot at a book bin this week where, in an act of the most fortuitous blasphemy, titles by Donald MacKinnon, G. W. H. Lampe, John Macquarrie, Alexander Schmemann and G. A. Studdert Kennedy, among others, were being thrown out. Yippee.